Twice daily I feed about a dozen stray cats which hang around my immediate neighborhood. Some were left by neighbors who moved away, some ARE neighbor’s cats but aren’t being taken care of, some wandered into the neighborhood, and some were dumped in the neighborhood. One such cat I named Emerald because he had gorgeous emerald eyes. He was male, but was the least aggressive male cat I had ever encountered. Indeed, he was timid to the extreme, and would only eat after all the other cats had eaten. In short order, I would watch to make sure that there was always enough food left for the dear boy. I call all these cats the Front Porch Kitties. This is because I also have Back Yard Kitties, and these are mine. My back yard is fenced, quite dramatically, with eight-foot-high walls of steel panels. This means the cats can’t climb the fence, so they are safe. They also have a heated winter cat house. At some point years ago I found Emerald in the back yard. Well, it is easy to get into the yard, but near impossible to exit. “Emerald! What are you doing back here?” I asked. He did not deign a reply. 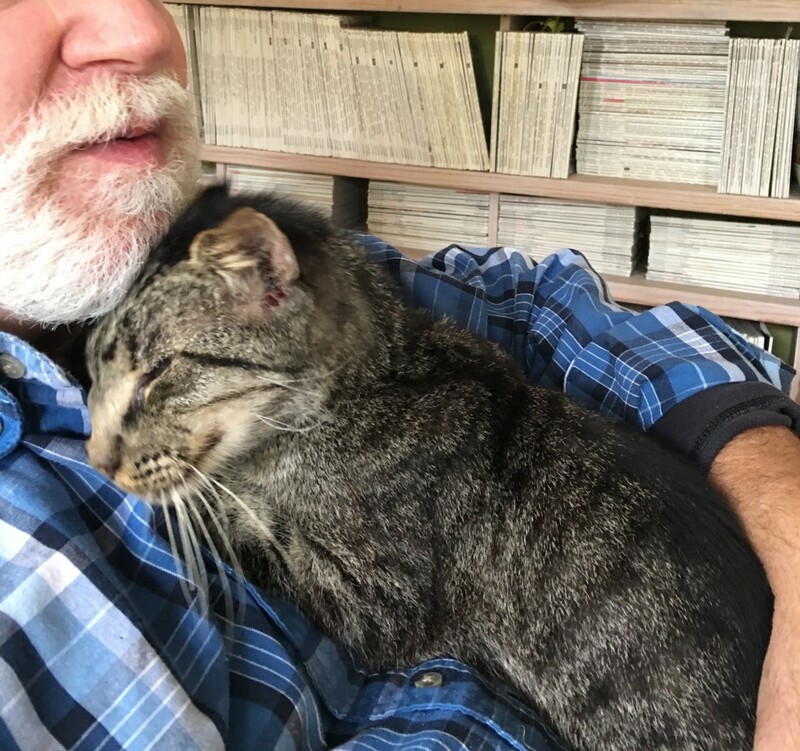 Having never touched him before, it took some enticing (wet cat food) to lure him to me, whereby I gently grabbed the scruff of his neck, and put him back into the front yard. I only did this however after putting on leather gloves and a leather winter coat, to protect myself from teeth and claws. I need not have worried. While he was NOT happy about being picked up, he did not, as was his usual form, exhibit any aggressive behavior. He just, it seemed, pouted. A few days later he was again in the backyard. “Emerald!” Again, I placed him in the front yard. He pouted all the way. This went on for months. I finally gave up and Emerald the Front Porch Kitty became Emerald The Back Yard Kitty. The years passed and this summer I belatedly realized that Emerald had gone completely blind at some point. Oh! And this realization instantly forced a change in my patterns. Instead of just putting food out twice daily, I had to assure that Emerald knew that food was out. Usually, he would amble slowly over to the deck, walking into walls and rocks and trees, but he would eventually make his way to the deck (which is but 6-inches higher than the ground). Once he found the food, I calmed. Ahhhh, all was well. Sometimes, Emerald would get stuck in a cul-de-sac of impediments he could not escape from, and I would rescue him even though I now well knew that he did NOT like being picked up or touched. Recently, he has dropped a lot of weight. Oh dear. And, frankly, he looks terrible. He did not four months ago. The cause might be that he could no longer eat the dry food I put out, as I noticed he seems hungry but had trouble eating. With some effort, I managed to get him to the vet, who said the cat was very old, at least fourteen. Fourteen? Geez. I had no idea. The vet wasn’t sure what was wrong with him, in addition to old age. I won’t go into the other obvious maladies afflicting poor Emerald, but it was clear that he had good reason to have trouble with dry food. So, once again, my patterns changed. I started feeding Emerald wet food, and we have now developed a ritual. I place a bowl of wet food just inside the back door. I open the door a bit. I call out to Emerald, while using my foot to nudge the other beasts away from the door. Emerald appears, and I call out to him. He ambles slowly inside, smells the food, and ambles over to it. While he eats, I feed the Back Yard Kitties (and goldfish) and Front Yard Kitties. I then do a few other things, and because I now have the timing down, when I return to the back door Emerald is finishing up. I then open the door and nudge him outside. Ahhhh, all is well. Whenever it rains I instantly race to the deck (which is roofed) to see if Emerald is on it. If not, I burst out into the rain to find him. He is invariably stuck into another cul-de-sac, and soaking wet. My heart is just stabbed with sympathy. I quickly pick him up (always first calling his name so he is not surprised by my touch), ignore his protestations and pouting, race him inside, towel him dry, and then gently place him on the deck. He ruffles his whole body, but seems, I think, just a tiny bit grateful. Last week it started raining in the morning. I raced to the deck…and no Emerald. I dashed into the rain…and no Emerald. Where was he? Then a question popped into my head: Did I nudge him outside after breakfast? Ahhhh, I was not sure. I went back inside, looked around, and no Emerald. I went back outside (with an umbrella this time) and still no Emerald. I went back inside…and found him. And could not have been more astonished. He was on my bed. 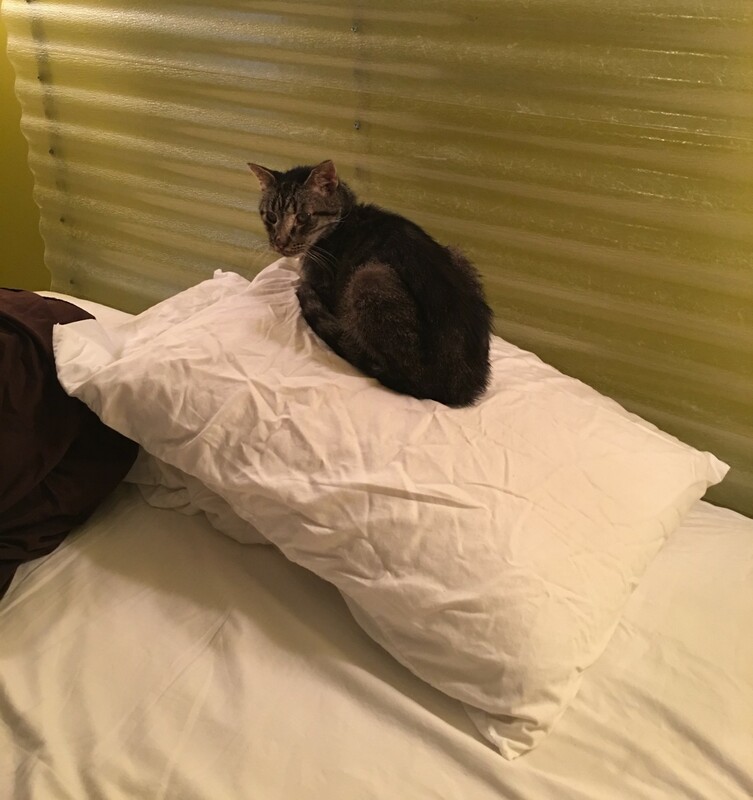 On my pillow. Emerald had never been in my bedroom. So, how did a blind cat figure out that the thing in front of him was a bed? And that if he jumped up he would land on something soft rather than a bottomless pit? I mean, if you watch him, he is incredibly timid in his movements. So, the first time wandering inside the house and he manages to find Comfort Central???????? With my eyes wide from astonishment, I gently laid down on the bed, and gently stroked Emerald. He instantly responded by getting up, and moving to me. Then he started nudging my head, and purring. Tears spontaneously filled my eyes. OMG, Emerald was…loving me. I continued gently stroking his boney body, and he continued nudging me with his head, while kneading the sheets. My eyes were wet. My heart was racing with joy. This was an incredible moment. The next day I was again astonished. After breakfast, I gently picked him up, and we walked over to the sofa. I sat down with Emerald on my lap. He instantly, as if we had done this a million times, sat up and started nudging me with his head, and kneading my chest, while deeply purring. An old and sick but happy cat. An old and happy guy, too. I can only think of one explanation for this astounding behavior: Emerald was, long ago, a cat beloved by somebody. An indoor cat. Who spent every night in a bed. Then something bad happened, and he eventually found his way to Ross Land. I am pretty sure that Emerald will soon be departing. In a week? Two weeks? A month? But it brings me immense joy that this poor creature, who has evidenced nothing but gentle spirit, should find comfort and love in his remaining time. You have a heart of gold, Ross. Or dare I say a heart of emerald? I’ve been very sick for two days and just bawled my eyes out over this. I’m so grateful he has you in the end. I am sorry to make you cry! Thank you! Did you read this one? Now my eyes are also wet with tears. I am at a friends home, taking care of her now both deaf and blind elderly dog. I should go home for the night, but I’m finding it hard to remove her from my lap and leave her to navigate through the night alone. These sweet creatures get into our hearts, don’t they? Blessings to you and Emerald. I think he might surprise you yet again with his life span. I agree! I hope Ross keeps him nice and warm and happy and fed in his last months (or maybe years – 14 is old, but not necessarily the end). I’m sure Ross will do right by Emerald, because it sounds like he is a kind, kind soul. Good on you, Ross, for taking care of the poor creatures others have so cruelly left behind. Oh Ross, you’ve made me cry! Again! God bless you for the things you do. You are a sanctuary for so many wounded souls. What a great story. I too, am in tears. It’s the little things in life that bring much joy. While others cried, I smiled my way through this post. We had Kimba, a cat like Emerald, who conveyed with our house when we bought it in 2002. The former owners took their dog, left the cat. She was timid and wary … wet food and proximity tamed her. I would sit on the front porch, beside the food dish, and read a book. I remember when she made the leap from feral to pet, after she came up lame from an infection in her foot. She allowed me to put her into a carrier, take her to the vet, and she was a perfect lady through examination and treatment. Whatever Emerald’s story before he came to you, his life with you has been full of love and care. You have a kind heart, Ross, dear. Bless you. I enjoyed learning about Kimba. Thank you! I love you for being so compassionate, Rescuing Ross! Bless you and all your furry crew! I think Emerald is trying to show you all the love you’ve given him is appreciated. I agree with Gia, you are Rescuing Ross. The look on his face tells you how grateful he is. A nice observation. Thank you! Please write a children’s book about how it’s important to be compassionate to animals. Your a great writer, with a big heart. My eyes are wet and my heart is filled with joy too, Ross. This. You. Both are awesome. Ross, this is a beautiful story, beautifully told, as always. I am so deeply happy that Emerald is now living inside with you and that he finally lets you hold him close and cuddle him. That he has given you his trust is such a huge gift. I truly adore you – your love & kindness to all animals is such a hugely important and meaningful contribution to this world. Bless you and your kind kind heart. Every blessing, every good thing, every wish coming true — that is what I hope for those who are kind to animals.